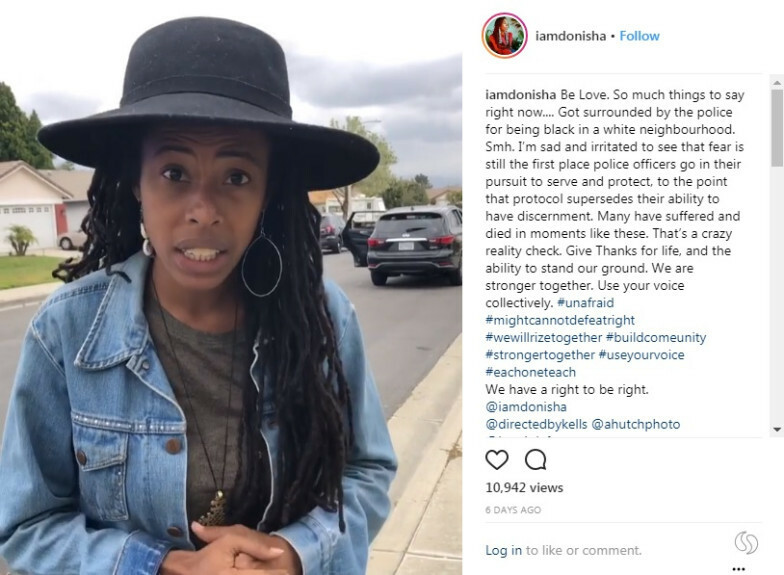 Police in Rialto, California have released bodycam footage of an incident in which Bob Marley's granddaughter was detained when a white neighbor reported her for suspected burglary. Donisha Prendergast was merely staying at an Airbnb, on her vacation, with friends, while Black. The Rialto Police Department was served Monday with a notification of pending legal action on behalf of Prendergast and two others, Komi-Oluwa Olafimihan and Kelly Fyffe-Marshall. The officers said they didn’t know what Airbnb was, asked for proof of the rental and detained the women for 45 minutes, Fyffe-Marshall continued. She said the reason the neighbor called the police was because the group didn’t wave to her. Prendergast and two friends were detained by police as they left the Airbnb rental where they'd been staying, while attending the Kaya fest in San Bernardino County. The rental was in a mostly white area. On Thursday, the artists held a press conference in Harlem, and demanded a criminal investigation into the white neighbor who called the cops on them. The police refused to believe the Airbnb host even when they phoned and spoke to police. There's video of one of the Rialto cops telling them someone reported "there's three black people stealing stuff." This April 30, 2018 image taken from video of body camera footage released by the Rialto Police Department and provided by KABC-TV, shows a woman outside a car pulled over by police in Rialto, CA. Donisha Prendergast, granddaughter of reggae legend Bob Marley, plans to sue the department, saying she and a group of friends were racially profiled while leaving an Airbnb. This April 30, 2018 image taken from video of body camera footage released by the Rialto Police Department and provided by KABC-TV, shows two women in a car pulled over by police in Rialto, Calif.
"There was an individual that placed this racist call with false allegations to the Rialto Police Department on April 30th. And we want her held accountable," said attorney Jasmine Rand, who along with Benjamin Crump, is representing the three women. Activist and artist Donisha Prendergast — the eldest granddaughter of reggae legend Bob Marley — filmmaker Kelly Fyffe-Marshall and Afrofuturist artist Komi-Oluwa Olafimihan attended the Kaya Festival in nearby San Bernardino and stayed at an Airbnb for two nights, along with a white photographer friend. As the four left on April 30, a neighbor called the police and reported a suspected robbery, after they didn't wave hello at her as they placed their suitcases in their car. The identity of the neighbor is not public. Police cars and a helicopter responded, Rand said. She said police told her clients a neighbor had reported three black people acting suspiciously. Airbnb’s senior advisor Laura W. Murphy and director of national partnerships Janaye Ingram sent a letter [PDF] to the Rialto Mayor and Interim Chief of Police.